What changes make the 2019 BMW X3 different? Addition of a rear-wheel-drive model and likely, launch of a plug-in hybrid. 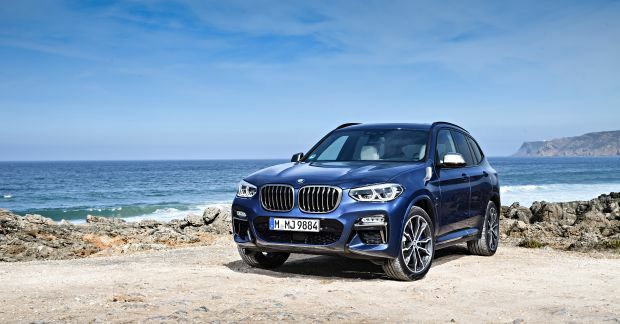 These changes continue BMW’s rollout of a premium compact-crossover SUV that was fully redesigned for model-year 2018. With slightly racier styling, new engines, and additional features, this third-generation X3 faces its most intense competition yet, and 2019’s expanded lineup could help it regain sales ground on such rivals as the Mercedes-Benz GLC, Audi Q5, and Cadillac CT5. The X3 once was the German automaker’s only small crossover but now it’s awash in alternatives within BMW’s own showrooms. These include the redesigned 2019 X4, which essentially replaces the X3’s squared-off wagon body with a four-door fastback roofline designed to appeal to an even more affluent urban audience. BMW mirrors that strategy in the premium subcompact-crossover segment with the smaller, less expensive X1 and its fastback sibling, the X2. And it relies on the formula to market its larger and costlier premium midsize-crossover duo, the X5 and its coupe-like cousin, the X6. Mostly to audition the plug-in hybrid or sample the rear-wheel-drive model. BMW is spreading plug-in technology throughout its lineup: it’s already available in the 3-, 5-, and 7-Series sedans and in the X5, not to mention being the sole system employed by the exotic i8 sports car. Expect the X3 variant to pair a turbocharged four-cylinder gas engine with electric-motor assist. Gaining an initial charge from a residential or commercial outlet, it should be able to travel around 15 miles on battery power alone. After that, it would automatically revert to conventional-hybrid form, teaming gas and electric power as needed and recharging via regenerative braking and coasting. Plug-in advantages would be envrio-geek appeal and performance that splits the difference between the X3’s base four-cylinder model and its hotter six-cylinder flagship, with better overall fuel efficiency than either. Unofficial reports say the plug-in X3 will arrive during calendar 2018, so BMW could conceivably market it as a 2018 model. Some reports also suggest there could be two plug-in versions, an xDrive30e with around 250 horsepower and an xDrive40e with some 325. The xDrive designation means they’ll come standard with BMW’s xDrive all-wheel-drive (AWD) system. Going into production in April 2018 as a model-year 2019 addition, the rear-drive-only X3 is badged the sDrive30i. Aimed at sunbelt drivers who don’t need all-weather traction, it eschews the xDrive30i’s AWD hardware, but shares its turbocharged four-cylinder engine and other features. It’s the least-expensive X3, and the lightest, too, by some 125 pounds compared to the xDrive30i. The 2011-2017 second-gen X3 featured an sDrive model, and also a turbodiesel xDrive28d. There’s speculation BMW is considering a diesel-powered third-generation X3 beyond model-year 2019. More certain is that the automaker will kick off its pure-electric era with the iX3, a version of this crossover powered exclusively by onboard batteries and charged from the grid. It would likely arrive during calendar 2020 and be followed over the next few years by a host of pure-electric Bimmer sedans and crossovers of various sizes. The iX3 would have slightly different front-end styling than its X3 stablemates, and probably would be rear-drive only. Range is speculative, with some reports citing the ability to travel about 160 miles on a full charge. However, BMW recently announced that by 2021, it’ll offer electric vehicles with a 435-mile range. If you’re not charged up about the plug-in and wisely realize a crossover fulfills its full potential with AWD, then don’t wait for the 2019. BMW could offer new colors or juggle equipment packages. Otherwise, the returning ’18 X3s will be virtual duplicates of their 2019 counterparts, but without the inevitable model-year price increases. And buying an ’18 gets you basic styling, engineering, and key features that won’t change for several years. This third-gen X3 uses BMW’s newest substructure and retains a rear-wheel-drive-biased design. It’s slightly larger than the previous generation X3 and has more connectivity and safety features. The ’18 lineup consists of the four-cylinder xDrive30i and the higher-performance, six-cylinder M40i. Both come with xDrive AWD. The xDrive30i sports BMW’s xLine trim, with satin-aluminum and silver-matte accents and 18-inch alloy wheels (19s are optional). The Luxury Package option adds chrome grille bars and two-tone bumper trim. The M Sport package mimics some elements of the M40i, adding the M Aerodynamic Kit with enlarged front air intakes, side-skirt trim, and a diffusor-style rear apron. It also includes Shadowline exterior touches and 19-inch alloys. M Double-Spoke 20-inch wheels with wider rear performance tires are optional. New to the lineup as part of the 2018 redesign, the M40i is the X3’s first real challenger to high-performance rivals such as the Audi SQ5, Mercedes-AMG GLC43, and Porsche Macan. It has slightly flared fenders and BMW’s M Performance-specific touches. These include the M Aerodynamic kit enhanced with gray metallic accents, darker tailpipe embellishers, and blue-painted aluminum front brake calipers. Nineteen-inch alloys are standard, with 20- and 21-inch cast light-alloy wheels optional. Except for “sDrive” badges, the rear-wheel-drive X3 is a visual twin of the AWD xDrive30i. The plug-in hybrid is apt to get some unique exterior details, but they’ll be subtle: “eDrive” insignia and the gas-filler-type door for the plug-in port in its front fender would be most noticeable. Inside, it’ll add instrumentation to monitor battery-charge status and range. And its center console would get an “eDrive” button enabling the driver to choose when to use available battery power for all-electric running. Overall, the 2019 X3 will mirror the 2018, with the brand’s latest “three dimensional” kidney grille and LED fog lights set in hexagonal lower-fascia openings. Wraparound taillamps emphasize vehicle width and are complimented by a tapered spoiler and dual-exhaust outlets. Despite a 2.1-inch stretch in both wheelbase (the distance between the front and rear axles) and overall body length, this newest X3 is hardly larger inside than its 2011-2017 predecessor. Front headroom, legroom, and shoulder room are up marginally. But rear legroom decreased fractionally with the redesign – an unexpected result, given the wheelbase stretch – and marginal knee clearance remains an X3 deficit. On the upside, the redesigned X3 added interior storage space, and even the least expensive version now comes with front sport bucket seats with power-adjustable side bolsters. The 2019 Luxury and M Sport packages will again add faux-leather dashboard trim, with the M Sport also featuring a unique leather steering wheel. The 2019 M40i will continue to sprinkle about “M40i” logos. Backrest sections of the 40/20/40 split/folding rear bench seat are individually adjustable and can be released remotely from the cargo compartment. The redesign increased luggage space to 28.7 cubic feet behind the rear seat, a gain of 1.1 cubic feet, but overall cargo volume decreased 0.6 cubic feet, to a still-competitive 62.7 cubic feet. Be aware, however, that ordering the optional space-saver spare tire introduces an intrusive housing that raises the cargo floor several inches, reducing carrying capacity and creating an uneven load floor with the rear backrests folded. The ’19 X3 will return with no-nonsense round analog-style gauges in a binnacle before the driver. The dashboard shows BMW’s latest practice, emphasizing a horizontally oriented central stack of infotainment-, climate-, and audio-system controls. 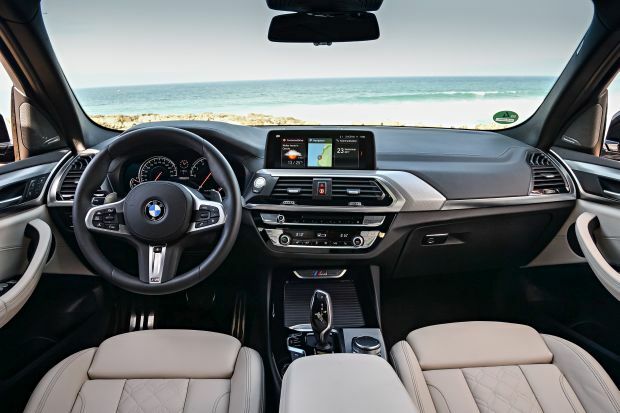 Again governed by BMW’s iDrive array of center-console knobs and buttons (and supplemented by available voice and gesture control) the infotainment touchscreen is a tablet-like display atop the instrument panel. With the available imbedded navigation system, it’s a generous 10.25 inches in diameter. Yes, courtesy of the expected plug-in hybrid – or plug-in hybrids — as described above. The sDrive30i is in effect addition by subtraction. It shares the xDrive30i’s turbocharged 2.0-liter four-cylinder engine, which will return for ’19 with 248 horsepower and 258 pound-feet of torque. BMW says the xDrivei30 does 0-60 mph in 6.0 seconds and the sDrive30i should be little different. The 2019 X3 M40i’s 3.0-liter inline-six is also used in the X4 M40i and will return with 355 horsepower and 369 pound-feet of torque. With a claimed 4.3-second 0-60 time, it’s a foil for the 354-horsepower SQ5, 340-horsepower Porsche Macan S, and 362-horse Mercedes-AMG GLC43. 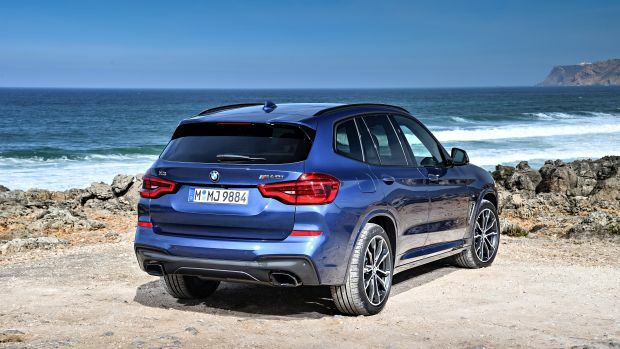 To enhance its throaty sound, the M40i has a flap-controlled M Sport exhaust system. Lost in the 2018 redesign was the turbocharged 3.0-liter inline-six-cylinder that motivated the xDrive35i; it had 300 horsepower and 300 pound-feet of torque and did 0-60 in 5.3 seconds. BMW could regain that middle ground with a future X3 model, or it may position the plug-in hybrid as the bridge between the four- and six-cylinder gas-only X3s. Regardless of powertrain, the 2019 X3’s sole transmission will remain an 8-speed automatic with steering-wheel-mounted shift paddles. In the M40i, it’ll again be tuned to M Performance specifications, with sharper shifts and calibrations that maximize engine rpm and throttle response on twisty roads. It also features launch control. The M Performance-tuned M40i will remain a step below the all-out M high-performance tier that characterizes such BMWs as the X5 M. But it will again have upgraded brakes and suspension, as well as its own Adaptive M Suspension option with electronically controlled dampers and even sportier suspension settings. It should also return with the variable sport steering system that’s optional on the xDrive30i. While no 2019 X3 will be billed as an off-roader, xDrive models should again have hill descent control and 8.0 inches of ground clearance. That’s slightly less clearance than most rivals, but xDrive does a good job automatically distributing power fore and aft as a traction boon on loose surfaces or in snow. Its focus, however, will remain enhanced on-road dynamics, aided by a rear-drive bias on dry pavement and the ability to constantly vary power among all four wheels to aid cornering. Like the previous X3, this one has an optimal 50:50 front-rear weight balance. The sDrive30i should match the xDrive versions for handling. From behind the wheel, the X3 is a solid performer but far from class-leading overall. The turbo 2.0-liter suffers acutely from off-boost lag. And despite the structural and engineering advances accompanying the 2018 redesign, our test drives reveal a crossover that hasn’t recaptured the top-notch road manners that once defined the BMW experience. The X3 is rock-solid at speed but lacks the eagerness and composure in fast cornering you enjoy in rivals from Porsche, Audi, and Jaguar and especially in the Alfa Romeo Stelvio. In particular, the BMW would benefit from more predictable and linear steering feel. If the plug-in hybrid arrives, the X3’s fuel-consumption picture certainly will be different. EPA ratings for the 2019 X3 were not released in time for this review but expect them to be unchanged for the returning gas-only models. That means 22/29/25 mpg city/highway/combined for the xDrive30i and, based on previous-generation ratings, for the ’19 sDrive30i, too. The 2019 X3 M40i should return at 20/27/23 mpg. All those ratings are about par for premium compact crossovers of similar power. As for some idea about the 2019 X3 xDrive30e plug-in, we might look to BMW’s 3 Series premium compact car line and its plug-in, the 330e iPerformance sedan. It’s rear-drive only, but uses a turbo 2.0-liter four-cylinder/electric-motor powertrain with an 8-speed automatic transmission very similar to that likely to be employed by the X3 plug-in. In the sedan, combined gas/electric output is 248 horsepower and 310 pound-feet of torque. It has a 14-mile pure-electric range, according to the EPA, which rates it at 71 mpg-e, or miles per gallon equivalent running purely on electric power. Operating in conventional hybrid mode, the EPA rates the 330e at 30 mpg city-highway combined. An X3 xDrive30e would probably have corresponding ratings. A more powerful xDrive40e is apt to have similar pure-electric range, although its mpg-e and conventional-hybrid-mode ratings would likely be less. Also adding to the base price are some key safety features, most significantly, autonomous emergency braking. This can bring the X3 to a halt automatically from around-town speeds when sensors detect an imminent frontal collision with another vehicle, object, or pedestrian. BMW calls it City Collision Mitigation and makes it part of the Active Driving Assistant Package. Also in the package is rear cross-traffic alert. It’s possible BMW will lower the price for 2019; Active Driving Assistant cost $900 on 2018 models but is listed at $500 for the ’19 sDrive30i. But it isn’t likely to follow the lead of top rivals and even some mainstream automakers and make it standard. Also subject to a price adjustment but not likely to be made standard is the Driving Assistance Plus Package. Expected to return at $1,700, it includes City Collision Mitigation, as well as active cruise control to maintain a set distance from traffic ahead, even in stop-and-go congestion. It contains lane-maintaining autonomous steering that corrects for unintended lane departure and can also follow the road for limited periods without the driver touching the steering wheel. It includes enhanced side, front, and rear alerts. BMW does give attention to safety features not readily obvious. For example, A system designed to anticipate a collision and automatically close the windows and moonroof should return as standard on all 2019 X3. And for owners concerned about the neighborhood or lot in which they’ve parked, BMW offers its Remote 3D View function, which uses the BMW Connected App to transmit a 360-degree, three-dimensional view of the X3’s immediate vicinity to a smartphone. Also back will be the available touch-free gesture-control infotainment interface, which responds to waves of your hand. The returning BMW Connected system supports iOS and Android devices, including certain wearable gear like the Apple Watch. And it enables owners to perform tasks like locking the vehicle and activating its ventilation system from home using Amazon Echo Alexa commands. Again available on all models will be a WiFi hotspot with internet connection for up to 10 mobile devices. Available wireless linking to Apple CarPlay allows you to project your mapping app on the dashboard screen. But for real-time guidance where there’s no cell signal, you’ll need imbedded navigation. The automaker’s Navigation Professional version links your X3 with other inter-connected BMWs, for car-to-car communication that shares information about traffic and weather hazards and adjusts navigation guidance accordingly. In cities with compatible parking-spot-locator service, the X3’s available ParkNow and On-Street Parking Information systems can project on the nav screen the probability and location of available parking. Estimated base prices are $44,000 for the 2019 xDrive30i and $56,00 for the M40i. Bank on little difficulty adding $6,000-$9,000 in options to either model to achieve your X3 luxury or performance ideal. For example, the M Sport package that gives the four-cylinder models a touch of M40i flare, including interior and exterior dress-up items and 19-inch wheels in place of the standard 18s, is $5,300, with an extra $950 for 20-inch wheels and $1,300 for the Dynamic Handling Package. Adding leather upholstery, along with ambient cabin lighting to any model, will require the $2,050 Luxury Package. Imbedded navigation, along with a head-up instrument display, heated front seats and steering wheel, and Apple CarPlay compatibility will again be part of the $3,400 Premium Package. And hands-free keyless entry, a panoramic moonroof, power front-seat lumbar support, cornering lights, and satellite radio will make up the $2,850 Convenience Package. Any exterior color other than white or black will again add $550. The 2019 X3 sDrive30i went on sale in April 2018. Release date for the other 2019 X3 models is after the second half of 2018. Acura RDX, Alfa Romeo Stelvio, Audi Q5, Cadillac CT5, Infiniti QX50, Jaguar F-Pace, Range Rover Velar, Mercedes-Benz GLC, Porsche Macan, Volvo XC60.